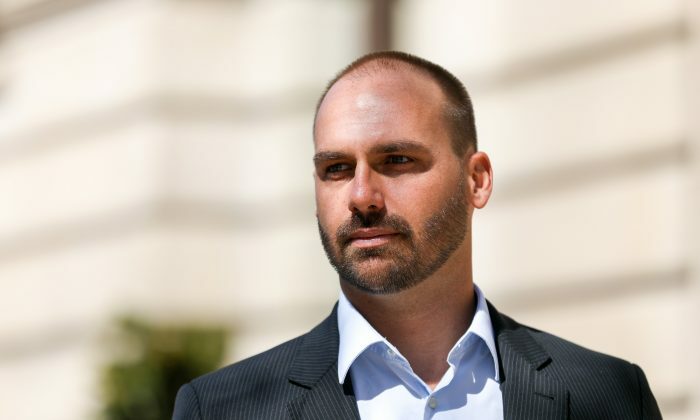 The Epoch Times had the opportunity recently to sit down with Eduardo Bolsonaro, a congressman in Brazil and the son of Brazil’s president, Jair Bolsonaro, to discuss the situation in Brazil, on the occasion of his father’s state visit to the White House on March 19. The Epoch Times: You have served two terms in Congress in Brazil, and in this last election, I understand you won in a huge landslide—you had more votes than any Brazilian congressperson has ever won. Eduardo Bolsonaro: Yes. It was a surprise for us. We weren’t expecting that much, but it was historic. It says a lot about the moment that we are living in and not only in Brazil. 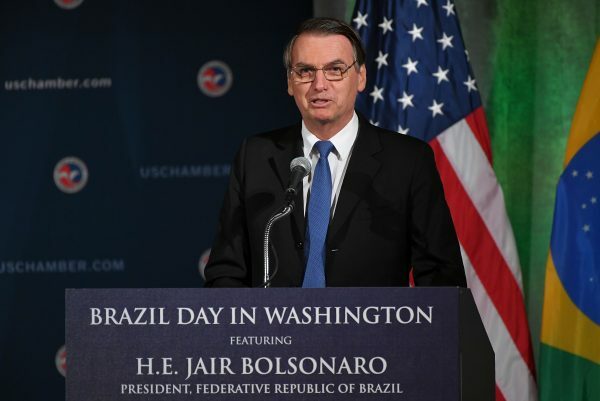 If you look around in the whole region, you have other people with the same thinking, the same way as President Jair Bolsonaro, and as Trump, too. You look to Chile, you have [President] Sebastian Pinera; Colombia, [President] Ivan Duque [Márquez]; Paraguay, [President] Mario Abdo Benítez; [President] [Mauricio] Macri in Argentina. So it’s not a movement about the extreme right, as the press usually sees that we are. It’s something that is natural and is a huge message that we don’t want socialism anymore. The Epoch Times: That’s an amazing change. I understand that just six years ago, there was no conservative party in Brazil. Is that true? Mr. Bolsonaro: That’s true. It was so hard for Jair Bolsonaro to find a party that would clearly support him to be the president. And now we are the biggest party of the Congress. We have this huge change. So it’s something that even sometimes it’s hard to believe in that, like a dream. The Epoch Times: Why do you think this happened so quickly and, as you say, not just in Brazil, but in several other South American countries? And who represented change? Who is saying what’s closer to the people? Then they find Jair Bolsonaro—because Jair Bolsonaro, he didn’t spend even $1 million during his whole campaign. He is someone that gave his country 17 years in the army and then almost 30 years as a congressman. And he doesn’t have too much support from political parties. So, it was a hard election, but we had one thing that all the other candidates, they didn’t have. It’s the people on his side. The Epoch Times: Well, this is a really interesting story. I understand the people were sick of corruption. There have been socialist governments for decades. What managed to pull the people together? It’s one thing to be unhappy with the way things are going. It’s another thing to see that there is an alternative and that your father offered the Brazilian people a different chance. Mr. Bolsonaro: You have a video on the internet that shows ex-President Lula talking and laughing, like celebrating, that you don’t have even one candidate [who is] right-wing. It was, I think, in 2010 or 2014. It’s because it was hard to grow up. You know, in the beginning, socialism is like a school. People like it. Everybody has money. Everybody can buy everything, but then soon or later, comes the account. And in Brazil, when this account came, it was during the term of Dilma Rousseff. And we faced 14 million unemployed. It was really hard. It was, I think, the worst crisis, economic crisis, ever in Brazil. It also helped us in [making] this change. The Epoch Times: So, the people can see that things were not working? Mr. Bolsonaro: Yes. Clearly, clearly. And it’s not just one point. If you look at security, we have records year after year in Brazil. We are facing record numbers of murders. And they say, “He is robbing because he couldn’t go to this school when he was younger.” They say, “The problem is our society because people don’t like black people.” This whole thing is about political correctness. But when people open their doors, the world is totally different from what the government is telling them, and people were fed up with that. There is a sense of responsibility that we [the members of Jair Bolsonaro’s party] have. Like we don’t have a second chance. We have only one bullet and we have to do the right thing and change the whole history of Brazil. Because we are clear that if we fail, the left-wing guys are going to come back with the whole history, and Brazil is going to be much closer to Venezuela than the United States, for example. 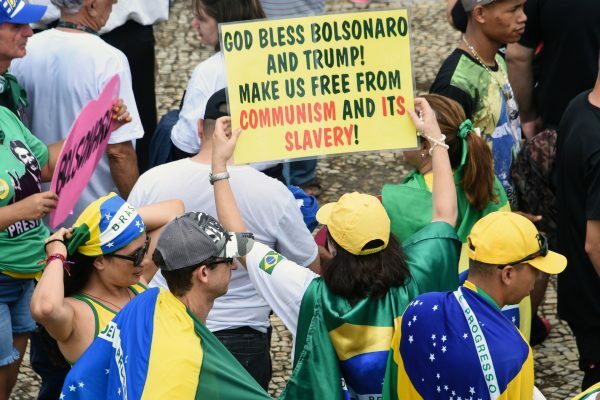 The Epoch Times: So this miraculous change that happened five or six years ago, where suddenly Brazilians said, we’re sick of socialism, you see that as being fragile, that if you don’t show them what works, they’ll flip back to socialism. Is that the case? Mr. Bolsonaro: Yes, yes, for sure. Because it’s easy, the speech [used by the left]. What do they do? They say: “Hey man, I’m here for the peace. Everyone who says something different, they are against peace.” “Hey, hey, man. I’m here to protect you, black people. Everyone who says against what I’m telling you, they are racist.” And they keep on with all the other issues. That’s why they say that Bolsonaro is racist, xenophobic, homophobic, Nazist, fascist, and now, the other stuff. They are even creating new words, bad words, to say that Bolsonaro is like this. And then when you go to the internet, where you don’t need the mainstream media to tell you what is going on, you can see with your own eyes—just open Instagram on your smartphone, or Facebook, and you’ll see totally different people. So the internet was essential in the campaign of Jair Bolsonaro to show people who he is, that he’s not racist, fascist, Nazist, xenophobic, homophobic, and all the other stuff. And what they [the left] are doing in Brazil, they do in the United States, they do in Europe, they do in Chile, in Colombia. They are all very well-connected, and that’s why I want to use my influence and the position that I have now to build it around the world—to make this miracle that happened in Brazil also happen in other countries. So that it isn’t a small wave, it’s permanent. We really have to organize and stop socialism as long as we can. The Epoch Times: So social media was what allowed your father to break through the left’s narrative to establish a direct connection with the people? That’s the story? Mr. Bolsonaro: 100 percent. If you look at the social media of Jair Bolsonaro, it is huge. It’s even bigger than a lot of soccer players or entertainers. And it made the total difference in this campaign. And I have to say that my brother, Carlos Bolsonaro, he’s handling the social media of Jair Bolsonaro. Carlos doesn’t like to do interviews. He doesn’t like to appear too much, but he’s the biggest guy that [had] a responsibility in this election. After the stabbing of my father, he stayed 77 percent of the campaign time in the hospital or at home. The Epoch Times: For those who may not be completely up to date on Brazilian politics, in early September, your father suffered a very serious knife wound in an attack. Did he almost die? Mr. Bolsonaro: Yes, it was really hard. Some time ago, I wasn’t even able to talk about that, because I got kind of emotional. But I’m getting used to it. When he was stabbed, I was campaigning in the state of São Paulo. He was in a neighboring state called Minas Gerais, in a city called Juiz de Fora. And someone called me and said, “Be calm, your father got stabbed.” And I said, “OK, how bad was it?” Then a little bit later, people started to talk, and I was getting a little bit nervous. And my oldest brother, Flavio, he tweeted, “OK, it wasn’t that that bad, it was only superficial.” So I got calm. But when I went to a friend’s house and started to watch the news, [it said] he lost more than two liters of blood. It cut his intestines in four parts. He died and came back twice; he was really lucky. We say that we do believe in God because when he got out—it was so quick that the federal agents that were doing his security took my father from the crowd. It was around 20,000 or 30,000 people. It was so quick, and they went right to the hospital. So they knew the map and where the hospitals were, the nearest ones. The doctor said five more minutes and he could have died, because the heart was almost without blood. When he arrived in this public hospital in Brazil, Santa Casa de Misericordia, there was a crew with a specialist in the area that was necessary to do the surgery. This doesn’t happen all the time in Brazil, so he was really lucky. And doing this surgery, the doctors said that [out of] 100 people that [they] see with the same stab wound, only one survives. So my father said that he thinks that he has a mission to do here. And it was too much [of a] coincidence to believe that you don’t have the hand of God in that. The Epoch Times: Why do you think this attack happened? Mr. Bolsonaro: The guy who stabbed him, he was part of the PSOL—the Socialism and Liberty Party, [although] he was not part of this party since 2014. And it’s someone that would kill him to take him out of the presidential race of 2018 —this is for sure. Sometimes, people try to say that no, he was like a lone wolf—it was something solitary. No, no, no. It was something made by a leftist. Imagine if the opposite happened: someone that was part of our party stabbed a left-wing candidate. They would be crazy with that. The Epoch Times: Your father is often compared to President Donald Trump. Do you think that’s a good comparison? Mr. Bolsonaro: Before 2016—before the Trump election—people in Brazil didn’t know too much about Trump. And what happened is that, as we said, the left-wingers are very organized all over the world. The message that Brazil was receiving about Trump, it was that kind of left-wing message: that he doesn’t like the Mexicans, he wants to build a wall, he doesn’t like black people, he wants to do politics only for rich people. It’s the same things that people said about Jair Bolsonaro. Correction: A previous version of this article misidentified the country of Hugo Chávez and Nicolás Maduro. They are the former and current leader of Venezuela. The Epoch Times regrets the errors.